Treat yourself to a friendly French Quarter romp filled with history and storytelling. Start your tour at the world famous Café du Monde and make your way to see Jackson Square, the Mississippi River and other well-known landmarks. Take a look at locally-made crafts in nearby shops personally selected by your guide. Learn about the bustling port city and its influence of many cultures as you explore famous sites such as the French Market and the Old Ursuline Convent. Relax and enjoy the lovely Royal Street along with a discussion of ironwork and the significance of street names in the Vieux Carre. Walk in the footsteps of William Faulkner and Tennessee Williams and visit the sites where they created classics. 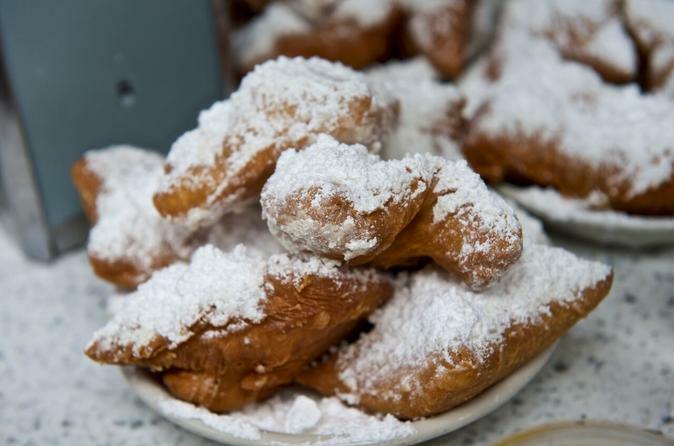 You'll begin at Café du Monde where a licensed guide will meet your small group. From there you'll view Jackson Square and the Mississippi River from a scenic overlook. The strength of the river, the importance of the port, the topography of the neighborhood are among the topics explored. You'll sample shops in a relaxed style highlighting well known products with the intention you'll immerse yourself in shopping at a later time. Learn about various immigrants and their resulting cultural contributions. Cherish world famous sites such as the French Market and Old Ursuline Convent as we sashay downriver. Relax and enjoy the ever-lovely Royal Street along with a discussion of ironwork and the significance of street names in the Vieux Carre. Walk in the footsteps of William Faulkner and Tennessee Williams and visit where they created classics. Treat yourself to a small group experience and avoid being part of a herd.